Are you a teacher or a parent? Both? Chances are if you’re a reader here at the Kitchen Table Classroom you’re one of those and I’m certain you’ve got a real interest in how kids learn. 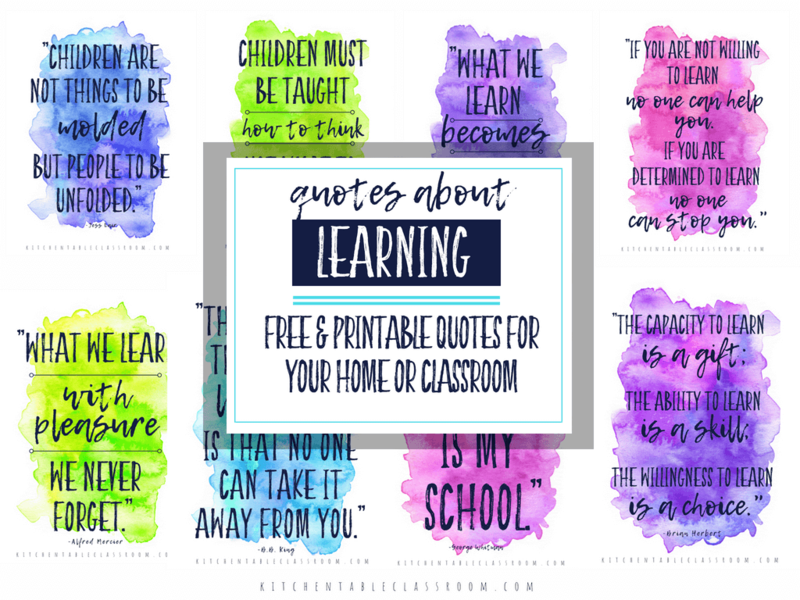 These free printable quotes about learning will remind you how awesome it is to be able to inspire learning! For those of you that don’t know me I’m a former public school art teacher turned homeschool mama to my four little people. (Some are not so little anymore!) I have my Masters degree in education. I have serious pedagogical ideas about the hows and whys of what makes a learning experience a memorable one for a kid. Here’s the thing about that paragraph above. Most of the ideas and things that I really believe about how kids learn wasn’t learned as part of my undergrad work or even my Master’s thesis project. My ideas about how kids learn the best come from working with kids for years, from observing their reactions, and being around long enough to see some long term outcomes. So I have this fancy degree on paper but what I know about kid’s learning that really counts has nothing to do with earning said fancy paper. What does that have to do with anything? It means we’re all teachers. Some of us may have a piece of paper that allows us to teach within the school system but there are one million ways to inspire kid’s learning both in and out of that school building. Are you a coach, a 4-H advisor, a grandparent? Then you have a vested interest in this learning thing! My thoughts (the short version) about learning are that I want to teach my kids how to learn, how to find information for themselves, and to be excited about new things. Learning is not a chore. After that it’s up to them. In this technology filled era anything we want to know can be called up in a few taps of a button. This is exciting, people! Are you looking to provide your child with a specific experience or even a mentor? It’s so exciting to be able to put your child in a situation in which they are soaking up knowledge but it feels like fun. That’s the best learning! Learning looks different for every kid and in every stage of life. The big idea is this- don’t stop! Keep learning. Be a teacher and a student everyday no matter your age! 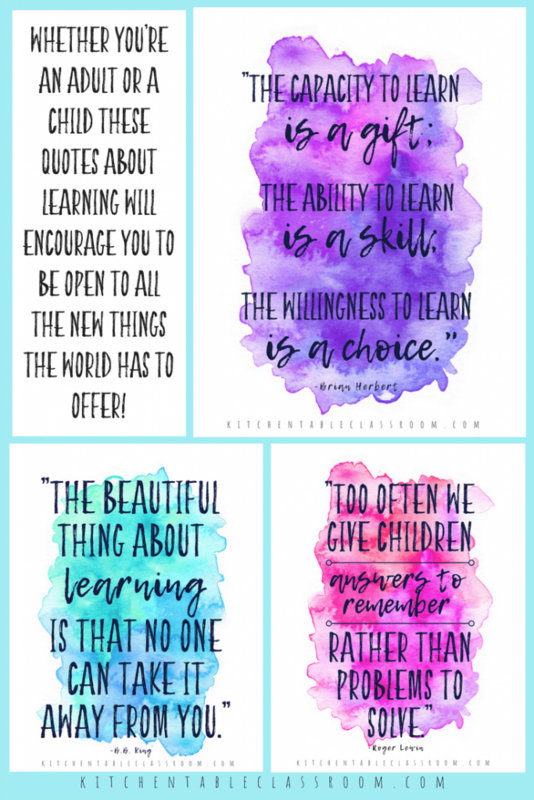 This set of nine colorful quotes about learning is available for free in my Resource Library. Use the turquoise form below to become a subscriber to my weekly newsletter. You’ll be the first to know about me newest projects and free printables! Upon confirming your subscription you’ll also get a password emailed to you that opens up my Free Resource Library. 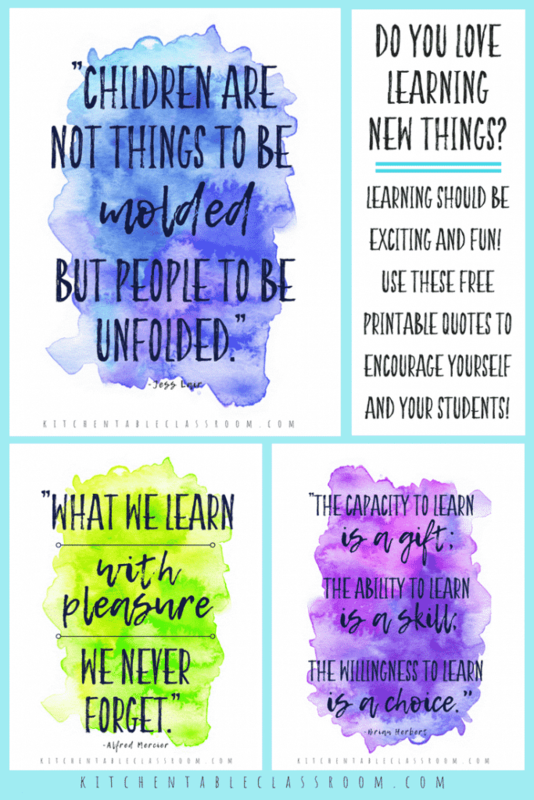 Log in and look for the heading “Pretty Printables” and you’ll see a thumbnail image of these quotes. Click on it and the PDF will pop right up. 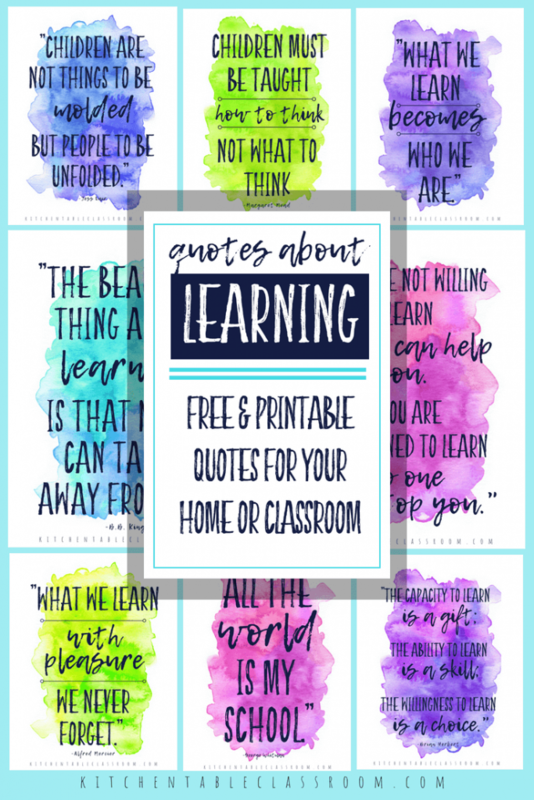 Print out your quotes about learning and you’re ready to go! 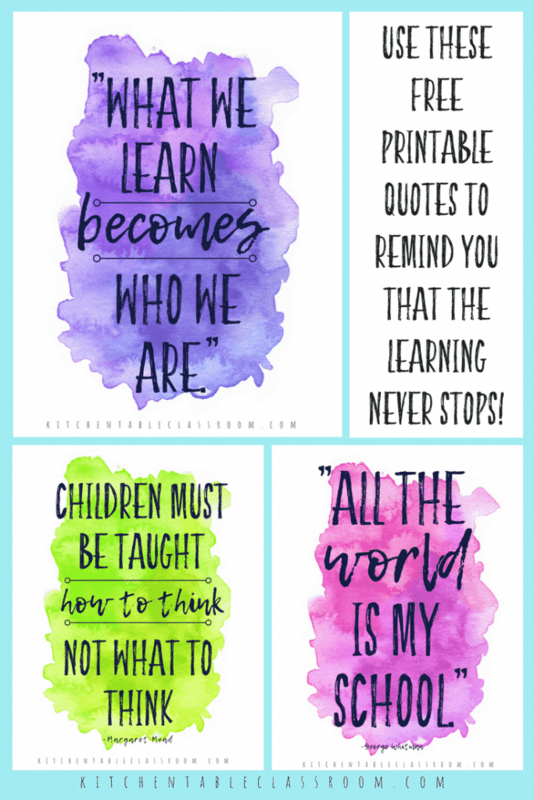 If you enjoyed using these printable quotes about learning I hope you’ll consider sharing on your favorite social media channel. Every share helps me to bring you more free printables and fun projects! I just love the printable quotes. What is the actual size please? Thanks Sheriece! They are sized to fit 8.5 x 11 printer paper!